In 1937, in anticipation of renewed conflict, The Middlesex Regiment had converted from an Infantry Regiment to a Machine Gun Regiment. The Depot became a Machine Gun Training Centre for which many new facilities were required. Whilst they were under construction the parish population had once again to play host to the military when large properties such as Oakfields and Wentworth Hall were requisitioned and many households had troops billeted on them. In 1941 the Centre moved to Chester for safety reasons, leaving a much reduced Regimental Staff at The Depot under the command of Colonel M. Browne and Major A.W. Clark. The Depot continued to play a role in Home Defence in training and supporting units of the Home Guard. The grave of Pte. 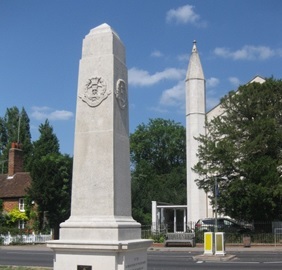 Peet of the 15th Battalion of the Middlesex Home Guard killed in action in Mill Hill is in the graveyard close to the graves of Colonel Browne and Major Clark who remained at the Depot after retirement as Colonel of the Regiment and Regimental Secretary respectively. The Regiment saw action in many theatres of war during WWII serving again with great distinction in the Far East and France. In the post war years it saw service in the Korean Conflict. The casualties of those conflicts too are commemorated in the church. Post war, The Middlesex became once again an Infantry Regiment returning to a training role, operating from 1947 to 1951 as No 27 Primary Training Centre and Depot; though now sharing the Mill Hill site but acting independently of a unit of The Royal Engineers. After 1951 it returned to its original role as a training centre for the Middlesex Regiment only, though now as well as Regular recruits there were National Servicemen to be trained. This training included '...one hour weekly of religious instruction, which is conducted by chaplains of all denominations' and 'there is a service n the Regimental chapel every Sunday... which recruits are free to attend'. The Anglican component of this training was carried out by clergy from St.Paul's and oversight of the chapel remained with the Vicar, now formally recognised as the Chaplain and supported by a Chaplain's Assistant. Throughout the 1950s the British Army was once again in the throes of reorganisation leading to a decrease rather than an increase in size. A consequence of this was a decision to amalgamate a number of Regiments including the Middlesex Regiment requiring it to leave Mill Hill. The Regimental flag was taken down for the last time on 31st June 1961 to conclude one chapter in a close association between the Regiment and St. Paul's Church covering some fifty five years. That association exists still however for after the departure of the Regiment in 1961, the barracks site was occupied by the REME later to become the Royal Logistic Corps operating the British Forces Post Office on the site. 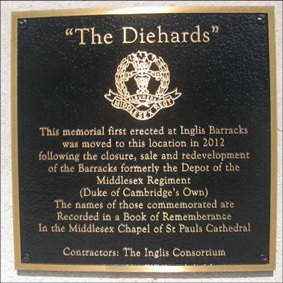 Throughout that occupancy, the Middlesex Regimental Association was welcomed each year to hold services at their War Memorial on Albuhera Day and Remembrance Sunday, services at which the Clergy of St Paul's officiated. The Association also provided wreaths to be placed on their memorials in the Church on Remembrance Sunday. Further reorganisation led to complete withdrawal of the Military from the Barracks in 2007 coupled with a decision to redevelop the site for housing (Millbrook Park). Concern was expressed by the Regiment and the community at large over the fate of the War Memorial. Negotiation between the Association, Barnet Council, the Vicar of St. Paul's and the Developers of the site resulted in the relocation of the Memorial in November 2012 to a position on The Ridgeway in line with the front of St Paul's Church where it was rededicated on July 18th. 2013. In September 2014 a stained glass window designed by John Reyntiens was installed in the Church. This window, the gift of the Regimental Association, is intended as a memorial of all who have served in the Regiment throughout its long and distinguished history. It is fitting that it should be in a building which for many years was part of that history and will keep alive the memory of the Regiment in Mill Hill. For further information on the Regimental Window, click here.